2000 AD arrives at Thought Bubble this weekend! It’s the Thought Bubble festival in Leeds this weekend, Earthlets – and what a feast for any 2000 AD fan! 2000 AD will be at tables #37-#38 in the Thought Bubble Marquee with the latest graphic novel releases, creator signings, exclusive first-glimpse creator sketchbooks, and more! 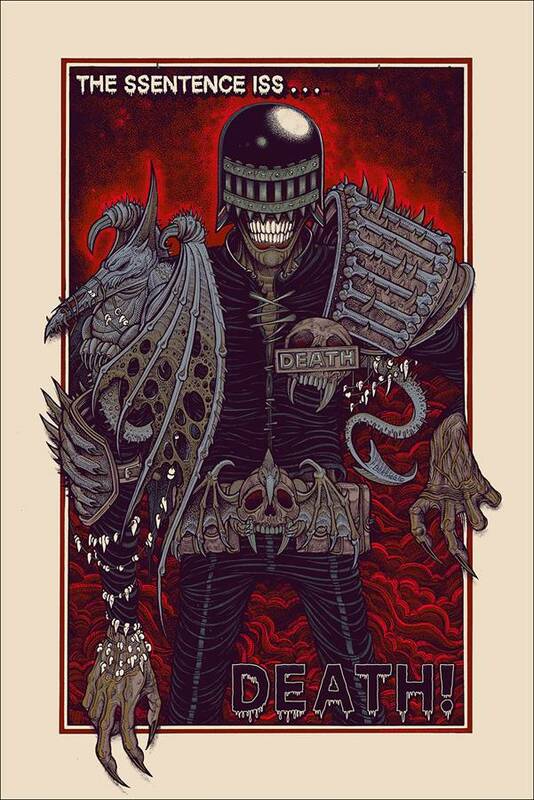 This year, we’re thrilled that Mondo, the company behind incredible limited edition screen printed posters for classic and contemporary films, television shows and comics, have partnered with 2000 AD to release an exclusive poster for Thought Bubble attendees – JUDGE DEATH poster by Florian Bertmer. Mondo will have the variant poster available in Thought Bubble’s New Dock Hall, with the regular version available online after the convention. 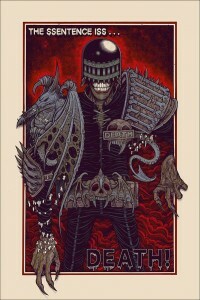 Vice Press will be unveiling the next releases in their officially licensed line of limited edition 2000 AD art prints. Produced by Vice Press co-owner Matt Ferguson, these two prints feature the classic 2000 AD series Strontium Dog (edition of 100, 18”x24”, £25) and Judge Dredd (edition of 120, 12”x6” Screen Print, £10). Both pieces will be released exclusively at the Vice Press booth in the New Dock Hall Foyer at Thought Bubble, with remaining copies going online at Vice Press on 16th November. The 2000 AD booth will also have 40 early copies of the Judge Dredd Sketchbook. Forty copies of this special book – featuring brand new sketches from Brian Bolland, Greg Staples, Charlie Adlard, Cliff Robinson, Kev Walker, Chris Weston, and many more 2000 AD artistic alumni – will be available for just £10 at the show and it’s first-come-first-served. Plus, we’ll have two of our top talents signing at the booth during the weekend – Henry Flint and Jon Davis-Hunt! It’s not for the faint of heart, but one lucky Earthlet could win the chance to write for 2000 AD! Budding writers are invited to pitch their idea for a four-page Future Shock to a panel of editors and creators in front of our live audience! Entrants for the 2000 AD Portfolio Competition should bring their entry to the 2000 AD booth for editorial droid Cyber-Matt to offer feedback and decide whether they’re worthy of going through to Sunday’s panel! The victor in this year’s 2000 AD portfolio competition will win the ultimate prize – paid work at 2000 AD! Come along and see which of the portfolio review entries wins this amazing prize as Tharg’s art droids provide live critique on the best entries submitted!